We decided to dive in…to the world of cloth diapering, that is. My husband and I decided this after our newborn gift stash of disposable diapers from our baby showers was gone and I went out to buy our first pack of diapers. After paying 40 dollars for a bit more than 200 diapers, I knew something needed to change. We have been flooded with all the questions in our heads: How will we ever learn the lingo, the types of diapers, and how to make this work for an average middle class family? Not to mention questions from family members and friends: You have to touch poop?! (Spoiler alert: You have to touch poop with disposables on occasion, too!) Isn’t your washing machine going to be gross with all the waste in there? (Another spoiler alert: With a newborn, almost every outfit gets poopy and is thrown in the washer anyway). As a disclaimer: I am a newbie, a first timer. I do not claim to have any expertise on the subject other than being an active participant. My husband and I mulled over the idea of cloth diapering for months. After meeting several parents who have chosen this route and taking a class, we decided to try this out for ourselves. We took a class at a local store, Green Bambino, when our daughter was about two months old. The class was a couple hours long and they went over all the different types of cloth diapers, cloth wipes, and how to care for your cloth diapers. After taking this class, we decided to start with what seemed to be the easiest (and cheapest) route: prefolds and covers. 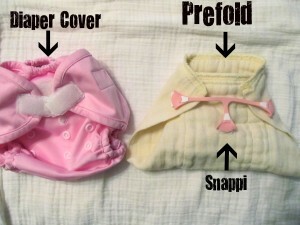 Prefolds look a bit like kitchen rags and can be folded up like an old-fashioned cloth diaper and closed together with a Snappi, or they can be folded into thirds and put inside a cover. When it came time to make our resolutions for the New Year, my husband and I decided that fully diving into cloth diapering should be our number one goal for many reasons. The most obvious reason – cloth diapering is better for the environment. Yes, you are using water and energy to clean and dry them, but the impact is minimal compared to a landfill of dirty diapers. Also, you can line dry your diapers if you want to cut down the impact of using a dryer. We want to save as much money as we can and disposables end up costing thousands of dollars for the two years plus that you will end up using them. There are so many options. All-in-ones, all-in-twos, prefolds, flats, pockets, and so on. There is a diaper for every occasion! After the start of the New Year, we went to The Changing Table to set up our diaper trial. We were able to pick out the types of diapers that we wanted to try out to see if we like them. I gravitated towards mostly all-in-twos because I figured I could get the most all-day use out of them since as long as the waste doesn’t hit the shell, you can snap out the inserts and replace with a new one. We, of course, decided that we needed to try more than one type of diaper so we were loaded up with a combination of all-in-ones, all-in-twos, pockets, nappies, prefolds, and covers. We are now on Day 3 of our trial and have officially gone more than 48 hours in cloth without so much as touching a disposable. I am looking forward to our future in cloth. Are you interesting in cloth diapering or have you already started? We would love to hear your thoughts and tips, just share in the comments below or on our Facebook page. That is really awesome. I am a cloth diapering Grandmother and I converted my DIL’s to cloth 3 yrs ago. I am active in several cding groups and I urge you to try Applecheeks. They are made in Ca by 2 Moms trying to save the landfills as well. I have no connection to the company just the love of the cloth diapers. I have tried every brand out there and these are the best. Good luck on your journey and if you ever need anything please email me. I know several sweet cding Moms in Oklahoma. Check out the AC FSOT page on fb. I have heard lots of good things about Applecheeks, so I will definitely try those out. Thank you for the suggestion and for your encouragement. I look forward to hearing how your journey goes. 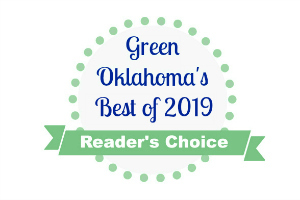 Cloth diapering is such a great way to save money and go green!